The beauty of Ahmed Bassiouny’s spirit emanates from his smile, which brightens almost every picture of him. 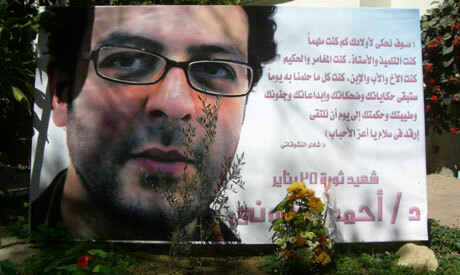 Bassiouny, one of the many martyrs of the Egyptian revolution, was an artist, a musician, a son, a husband, a father to two very young children and a tutor. He died tragically on 28 January, killed by a sniper’s bullet, and then his body was crushed under a police car. On Sunday, 13 March a commemoration ceremony was held for him at the High Institute of Art Education, where he used to teach. The crowd was mainly students, some of whom wearing black t-shirts with his picture on it, others crying silently, while being hugged and patted by friends, while others socialised or distributed pamphlets from the University. It is only when the visual artist Shady Noshokaty, along with Bassiouny’s father, entered the premises of the college that the crowd was hushed, their attention centering upon the newcomers. “When I look at his picture I feel he’s talking to me,” his father said weeping heavily. In the hall, which has been named after him, ‘The martyr Ahmed Bassiouny’ a 20-minute film was shown about the kind of person he was and the nature of his art. What was most powerful about the film is that it didn’t rely on melodramatic music or even any narration, it merely captured moments from his life, as well as his artwork. The image of a tree released a peaceful vibe and lasted for a few seconds when his name then appeared, followed by footage of him teaching in class. His teaching approach was fun and easy as he explained the waves of sound with the students eagerly participating. Much of his art was related to sound, digital equipment and lighting. Bassiouny acquired his master’s degree in the Creative Potential of Digital Sound Art and was working on his PhD thesis, the Visual Aspect of Open Source Programming in relation to the concepts of digital art, and he is considered one of the most important artists in the contemporary art scene in Egypt. Bassiouny won first prize in painting in the youth salon in 2001. He later expanded his work to incorporate multimedia in his art to win the grand prize at the youth salon in 2007, for his project, ‘Madena’ with Maged Mostafa. He also organised workshops on sound design. The film showed images of his art, meshed with the sound of him explaining the pitch and level of sound to his students. It also portrayed pictures of him with friends and students, laughing, smiling and acting silly, giving off a sense of just how pleasant a person he was. At this point sobs were heard from different corners of the hall. After the screening, an olive tree was planted in his memory at the entrance of the university, which his father watered for the first time. WHAT A TRAGIC LOSS.THIS MAGNIFICENT YOUNG MAN GAVE HIS LIFE THAT HIS FELLOW EGYPTIANS MIGHT LIVE IN HONOUR DIGNITY.GOD BLESS HIM FOR HIS SACRIFICE.